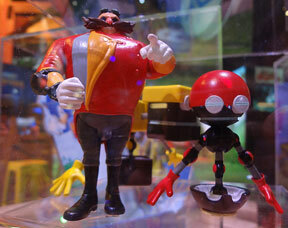 These figures were in display cases at E3 2014. 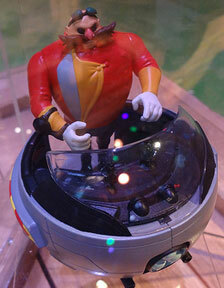 The Eggman here appears to be the same as the one in the Egg o Matic above (could it be a set?) 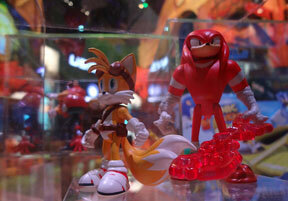 The Tails & Knuckles are different from their prototype forms seen on the Proto Page. Because no one really knows what "classifications" of Boom figures will be made yet, everything is just lumped into this one section/page and will be sorted out later. Examples include sorting by "figures & vehicles", large 7 inch size figures, 3 inch figures, ripcord racers, etc" Starting the Boom line means throwing a batch of different toys onto shelves & likely watching to see what does well vs. what doesn't. Once the figures form into "lines" and differentiate themselves, the Boom Figures pages will be created. 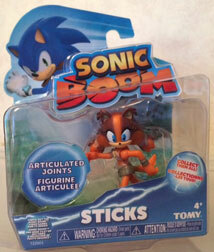 This is likely the final package / card design for the 3 inch size Boom figures. It has Sonic & the logo across the die cut top, with a labeled (whoever is inside) bottom front card with a picture of that energy cord stuff from the game. 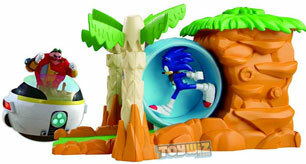 The background is a CG tropical scene from the game. 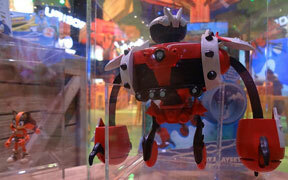 The dot says "Articulated Joints!" while the white space says "Collect them All". 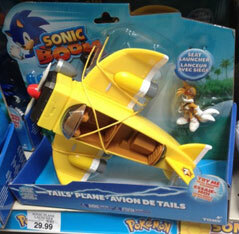 Is the airplane in Boom still called "the Tornado"? This figure is larger than all of the others so far, at 7 inches. 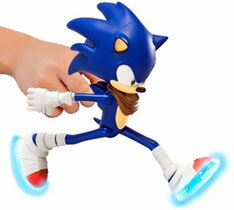 (That hand is likely there to show the size, it seems kind of tacked in there) The gimmick for this figure is that the shoes light up blue with a real glowing effect. 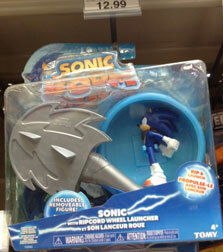 It also has sound effects like zapping noises and tapping / running sounds. Here is that launcher rock thing from the top of the page. You turn a crank on the back of the 'playset' (its not really a play set) to wind up the wheel & then push the grass tuft on top of the hill to set it rolling. You can see the gear on the side of the wheel at left. 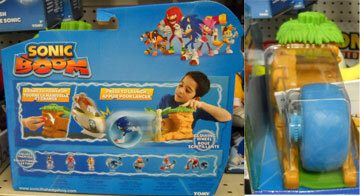 The box back says "Collect them all" and shows both normal figures & the ripcord racers. 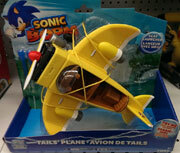 Keep in mind this item is 29.99! It's expensive! 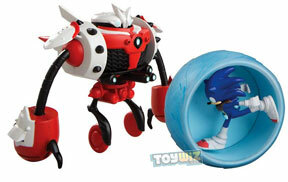 Did you pre-order Sonic Boom (for any system) at Game Stop? 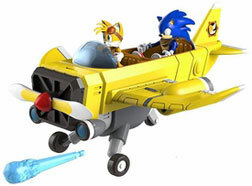 If you did, this figure was your pre order bonus. 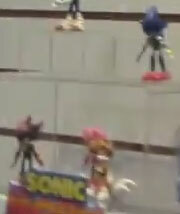 It's the Tomy 3 inch size Sonic, but with the exclusive item "The Ancients' Crystal" which is that purple clear thing there in the close up. That little rod that's in there with it is a holder that it snaps onto. 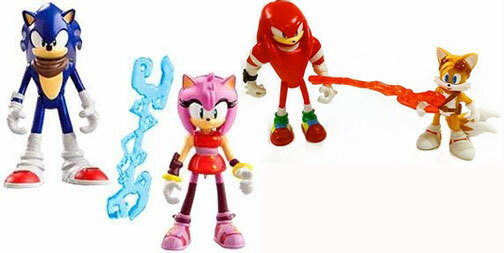 Normally, these would be called "Battle Damage" figures, but really they're "altered look" figures from specific episodes of the Sonic Boom Show. 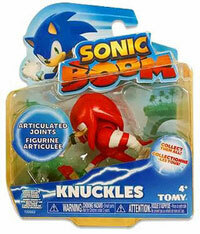 You can see "Unlucky Knuckles" from the episode where he thought he was unlucky & got hurt a lot (the 1 thing Boom figures need...is more bandages!) There's "Slimy Sticks" from the episode where she found a garbage dog that would barf out green goo, as well as "Oily Tails" and "Green Eggman" (he's a ham! 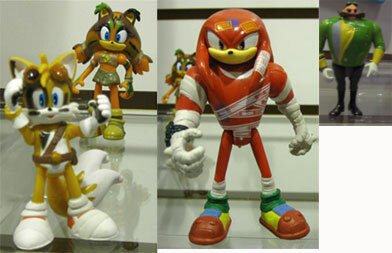 no..no) These were seen at Toyfair 2015, in February, so the Green Eggman & Oil Tails episodes did not yet air when the figures were shown. Notice something missing from this photo?